the first site on the web dedicated to the talented Australian actor! And we think its about time! Robert Mammone is a very talented and versatile Australian actor who has experienced a remarkably successful film and television career. He has consistently worked on many high profile projects and gained early recognition within the industry when he starred as Sam, opposite Russell Crowe in The Crossing directed by George Ogilvie. Robert has also featured in various Australian telemovies including McLeod's Daughters, The Flood, Official Denial, The Territorians, Twisted Tales, Cody and Never Tell Me Never. He has starred in a host of television drama roles in series such as Blue Heelers, Police Rescue, Good Guys, Bad Guys, Water Rats and GP. Robert's various film features include those produced in America such as Streetfighter with Jean-Claude Van Damme and Kylie Minogue. Peter Benchley's 'The Beast' was a two-part series in which he played a helicopter pilot called Raines, and featured a predominantly Australian cast. His most recent roles include Mahood in Craig Lahiff's critically acclaimed film Heaven's Burning (and our favourite), and Paulie in the cafe society comedy Spank!, filmed in Adelaide, Australia, where he originates. Most recently, he had a role in the box office blockbuster Vertical Limit. Look out for his upcoming role in the Matrix sequels, released in 2003. 10/11/03 See the News page for info on Matrix Revolutions, Robert's new film called 'Man-Thing', and a new photo of Robert as AK (Matrix Revolutions) has been added to the Picture Gallery page. 10/05/03 Robert is currently filming in Melbourne. See the News page for details. 03/02/03 - More detail on Robert's character in the Matrix films, and the Pact is on the news page. 21/10/02 - Info on one of Robert's films to be released in 2003; The Great Raid, is on the news page. 10/04/02 - The latest UK, USA, and Australian screening guides for April are up. Just go to the 'Screening Guide' page. 08/04/02 - Details on the Matrix Reloaded and The Pact are on the news page. Also added are more fan comments in the Mailbag. 05/04/02 - Check out the news page for Robert's latest filming details. 20/03/02 - There are new contact details for Robert as his representation has changed. Check out the contact page. 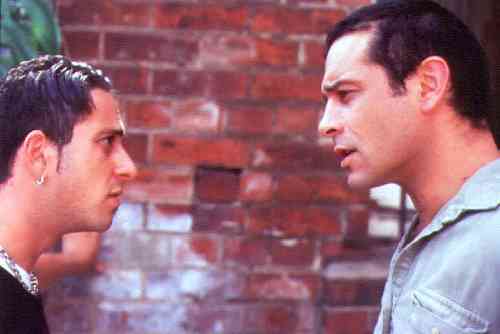 Robert Mammone (at right) as Paulie in Spank! Everything you could possibly think of on this great actor. I have searched for information on the web, and there really isn't anything out there short of a brief name mention in film credits. So this site aims to be the most informative and comprehensive out there. If you're looking for information on Robert's biography, films, TV appearances, articles, news, links and more, you are in the right place! Take a look around, enjoy your stay, come back often and let us know you visited by signing the guestbook. Do you want to keep uptodate with the latest news, and site updates? Then join the Virtual Robert Mammone list at Yahoo Groups by entering your e-mail address in the box below. Thank you for taking the time to visit Virtual Robert Mammone. Please let us know you were here and what you thought by signing the guestbook.